We are involved in presenting a quality assured assortment of Flexible Grinding Wheel. The grinding wheel is recommended amongst the clients for their availability in various sizes and specifications. These products are highly demanded amongst the clients for their safe use and reliability. We provide best quality of wheel carborundum to our customers. 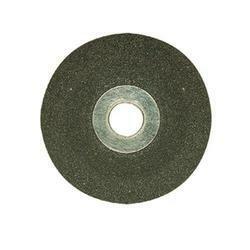 - Hitachi - Cutting Wheel - 14" , 7" , 5" , 4"
- Hitachi - Grinding Wheel - 7" , 5" , 4"
We provide wide range of Carborundum Emery Wheel which are fabricated from resin bonded aluminium oxide grains with the cloth backing. These flap wheels are offered width of 25 mm to 75 mm, with grit ranging from 36 to 1000 and the standard diameter includes: 100 mm, 150 mm, 200 mm, 250 mm, 300 mm. We offer Flute Grinding Wheels of Carborundum Universal Ltd..
We are engaged in providing our clients with high quality Carborundum Univarm Ltd, these find their applications in various sectors and are widely demanded by the clients for their quality.